Foreigners view Rashemen as a mysterious, magical land of harsh winters ruled by masked witches and populated by berserkers. Far away from the southern climates and the warming oceans, it is a barren waste of frozen plains and snow-covered mountains where a person can freeze to death overnight even in the middle of summer. Such talk is exaggeration, but it is based in truth. Much of Faerûn owes its safety and security to Rashemen, for this small nation has held its own against the armies and collected magic of Thay time and again, sparing Thay's other neighbors from the attentions of the Red Wizards. Rashemen is about the same size as Cormyr, running approximately 330 miles from its southern border at Lake Mulsantir to its northern reaches at the Icerim Mountains, and 270 miles from Lake Ashane, its western border, to its curving eastern border that ends at the southeast arm of the Icerims. The Sunrise Mountains and two small but thick forests divide Rashemen's lower third from the rest of the country, and most of its citizens inhabit this smaller portion. Although its size is comparable, Rashemen's harsh climate and remote location mean its population is less than half that of Cormyr. The lower third of Rashemen is a cool, hilly land of pine forests and heather-grown downs. The land climbs toward the east, quickly becoming quite rugged as one approaches the Sunrise Mountains. The northernmost reaches of the Sunrise range are lower and snowier than the southern portion bordering Thay, and from these well-watered peaks, innumerable rivers and streams flow west to Lake Ashane. Ages ago, glaciers scarred this land, carving deep U-shaped canyons in the mountains and trapping hundreds of tiny lakes behind moraines. The North Country, Rashemen's upper two-thirds, is mostly bleak, windswept plains with little vegetation other than hardy grass and scrub. The southerly reaches of this area consist of knife-edged rocky ridges with steep ravines covered with a thick pine forest, but the landscape flattens as one moves north, becoming a vast cold steppe unbroken for more than a hundred miles before the foothills of the Icerims rise up from the plains. The North Country lies 3,000 feet above sea level, as does much of the rest of Rashemen, and this altitude contributes to its harsh winters. 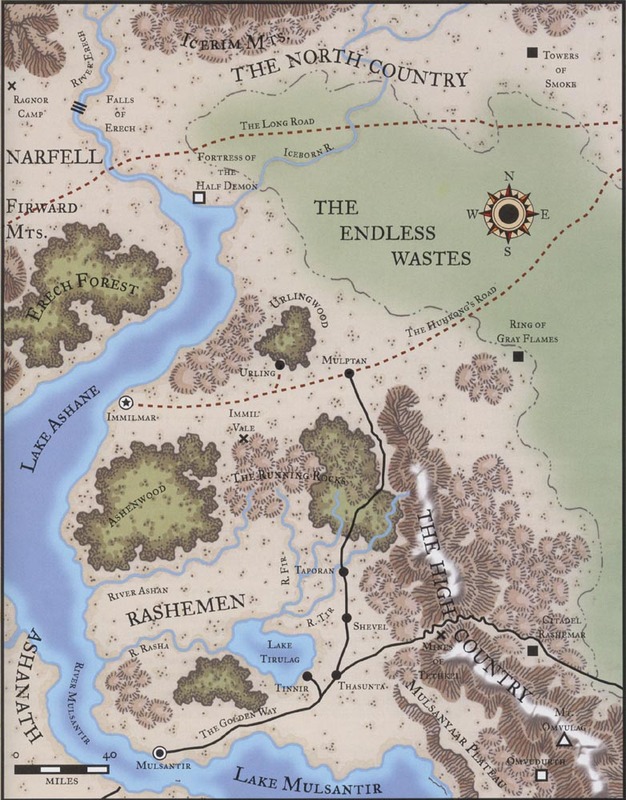 On Rashemen's western flank is a veritable inland sea, the great lakes of Ashane and Mulsantir. Stretching over 500 miles in length and more than eighty miles wide at their broadest point, these lakes occupy deep rift valleys between the high plateaus. of Ashanath, Thay, and the North Country. Rivers from the surrounding elevations drain into these lakes, which have no surface outlet. However, they are freshwater, not salt, which suggests that one or both are linked to seas or subterranean rivers in the Underdark. Magic has sculpted Rashemen's geography as much as wind and weather. Caught between the warring nations of Narfell and Raumathar long ago, Rashemen is a place of ancient wizardry and powerful spirits (called telthors) tied to the features of the land. Spirits guard the forests, mountains, and waterways against defilers - in some places, every stone and sapling has its own guardian. The local folk respect and take care to not offend the spirits, which are said to punish those who are callous toward them and bear grudges against communities for years. Lake Ashane is the longest natural feature defining Rashemen's borders. Icy cold and inhabited by water spirits and aquatic monsters, it is the lifeblood of many fishing villages. Ferries cross at Mulsantir, where the Golden Way spans the lake. The Ashane ices every winter, particularly in its narrower stretches, and caravans cross on foot when the surface is frozen. Lake Mulsantir is a turbulent body of water that forms part of the border with Thay. In years past, the Red Wizards stocked the lake with hostile magical crossbreeds, but such things were as likely to return south against their creators as to go north, so this practice has ceased. Some of the more cunning creatures survive, though, and are blamed whenever boats disappear on this lake. Mulsantir connects with Lake Ashane through a broad passage referred to as the River Mulsantir. Rashemen's southern border continues east from Lake Mulsantir along the Gorge of Gaurosto the Sunrise Mountains. Evil humanoids and natural predators make life dangerous for travelers and prospectors here. The border runs north past the ruins of Citadel Rashemar, which is inhabited by fell creatures and ruled by a powerful hag sorcerer, then north and northeast along the edge of the Endless Waste until it reaches the Icerim Mountains. Frost giants, frost worms, taers, and white dragons lurk in the Icerims, but these creatures dislike the relative warmth of the flatlands and are rarely seen there. The southern edge of the Icerims forms the country's northern border to the Falls of Erech, which flow downstream to join Lake Ashane. Most interesting features of Rashemen are confined to its southern parts. The eastern side of Lake Ashane cradles the Ashenwood, a wild forest inhabited by hungry monsters. East of the Ashenwood are the Running Rocks, a leg of the Sunrise Mountains reputed to have mystical powers and connections to the Underdark. The Urlingwood to the north is controlled by the Witches and forbidden to all others under penalty of death. In the middle of the southern flatlands is Lake Tirulag, fed by rivers originating in the forests and inhabited by an "ice dragon." This ancient forest is primarily ash, aspen, fir, and pine. Mighty spirits live in the stones and trees, capable of imparting great wisdom to listeners or exacting terrible vengeance on those who trespass. By ancient tradition, the Ashenwood remains unpopulated, both as a precaution against the anger of the spirits and as a promise to preserve the most sacred and pristine part of Rashemen. While no Rashemi live here permanently, some enter for a short time to hunt or to complete a quest. These visits always begin with prayers and small gifts for the spirits to ensure their favor. A typical offering is a flask of clean water, a handful of fertile earth from a garden or farm, and a meal consisting of several kinds of food that would appeal to the creatures of the forest. The meal is burned on a smoky fire in the middle of a circle of stones so the smell of it will reach the spirits. The subjects of a hunt are usually perfect specimens of a particular kind of animal (such as a stag), although dangerous dire animals are common prey as well. Whenever a hunt is successful, the hunters make offerings so that the creature's spirit will become a telthor or at least will not seek vengeance against the hunters. In addition to mundane creatures and spirits, fierce monsters inhabit the forest, such as annis hags, ettercaps, owlbears, stirges, and trolls. Some of these creatures are very old and cunning and have grown to unusual size. Rashemi legend tells of Hornclaw the Gray, an owlbear bigger than most giants and said to be over a hundred years old, and of Dar-Guran, a fell troll who can take off a man's head in one bite. Not all of the unusual residents of the Ashenwood are so dangerous. Bristlebeard, an awakened dire boar with patches of bright red hair, listens to the telthors and watches over Rashemi who become lost in the forest. Stormwind (NG treant of 20 HD) is a huge and ancient treant who sleeps for decades at a time but awakens to speak to the Witches when they need his council. Stormwind is so large that he has been mistaken for the Wood Man, a legendary embodiment of the power of the forest that is said to defend Rashemen against invaders. With the exception of the trade-town of Kront (see Settlements of The Great Dale) at its north end, this plain is completely uninhabited by humanoids. Grassy with rich dark soil and a few small herds of wild oxen and ponies roaming its length, the Ashanath is an untouched breadbasket. Resources are so plentiful in this area that they easily could support a large city-state such as those along the Moonsea, but people do not settle here because of the frequent tornadoes that tear up the earth for miles at a stretch. Regardless of the season or ambient weather conditions, this territory experiences dozens of tornadoes a year - sometimes as often as once a tenday. The Red Wizards of Thay use magic to ensure good weather for their slave-farmed crops, and many believe the strange storms in the Ashanath are a side effect of this artificial weather, or an attempt by nature to balance out the magically induced tranquility in Thay. In any case, the Rashemi avoid this area and do not consider it part of their territory. The only time they cross the River Mulsantir and go through the Ashanath is when traveling to Thesk. Theskian druids have imbued large boulders on the plain with spells that detect turbulent weather, so they have a limited awareness of when the storms are active. Fortunately, it is very rare for the tornadoes to reach the Golden Way or cross Lake Ashane. About twenty miles north of Kront, on the shores of the lake, lie the ruins of a great city. Known locally as the City of Weeping Ghosts, this place was once Shandaular, capital of the petty Nar realm of Ashanath. The Nentyarch of ancient Tharos destroyed Shandaular almost two thousand years ago, the final step in the unification of ancient Narfell. The place is haunted by many dangerous undead, including at least one nightshade. This remote forest lies outside the domain of Rashemen, but its dark and bitter woods are the home of angry spirits, hostile plants, and evil fey. The secret sisterhood of the durthans, aggressive counterparts of the hathrans, use the Erech Forest as their private refuge, just as the hathrans use the Urlingwood. The durthans invisibly travel to and from the Erech to meet with their sisters, train guardian beasts, and explore dark magic. Assassin vines, night hunters, owlbears, shambling mounds, and at least one gray render guard the forest, in addition to evil telthors. Most dangerous are the durthans themselves, who slay any intruders. Few people suspect the existence of the durthans and fewer still know of their base in the Erech, so it remains secure against concerted investigation. The durthans are in the process of building a fortress for themselves, dubbed Citadel Tralkarn. These falls mark the northwesternmost part of Rashemen. As the waters of the River Erech flow toward Lake Ashane, they plunge over a hundred feet in a roaring cascade of white that is breathtaking. Rashemi youths about to leave their country on a journey of adulthood camp here for at least one night and cast offerings into the falls to the spirits and deities. The falls are said to possess a magic that punishes thieves and rewards those who show the proper obeisance with good fortune and long life. Most Rashemi attribute any success in life to proper offerings. Over the centuries, a fortune in gems, coins, weapons, armor, and minor magic items has accumulated at the bottom of the cataract. However, only a fool would try to steal this wealth. The water is glacial runoff, little more than freezing, and it's constantly pounding on the rocks below. As well, the local spirits guard these offerings and slay any would-be thieves. The Rashemi themselves capture and execute any loot ers who manage to escape the spirits. Beyond the falls are a few humanoid tribes, but they rarely are brave enough to tempt the wrath of the Rashemi, instead harassing the small Nar horse tribes to the west. This northernmost portion of the Sunrise Mountains is a place of dark hills, ancient monoliths, wild magic, and strange occurrences. Few go there, and the Rashemi who live in this place are a cautious and suspicious folk. The High Country is a chain of high peaks surrounded by a scattering of hills. Ragged and forbidding, the slopes hide hundreds of small ravines and valleys, many of which are filled with snow for months. They claim dozens of lives every year from fools who mistake a smooth white break in the mountains for a pass, only to discover it is a thin crust of snow and ice over a hundred-foot drop into a crevasse. Some of the monoliths are markers for old Raumathari sites, but others are magical traps created by the Raumathari wizards to imprison Nar demons. If broken, these stone prisons would release any trapped fiends, so the Witches of Rashemen check the known monoliths every year for wear and damage. Other structures predate the Narfell-Raumathar war and may be wayposts left by the Imaskari or an even older race. Natural animals avoid the magical stones. Grim hunters who prefer solitude sparsely inhabit the mountains. Even the most nature-savvy Rashemi wonder how these folk manage to survive. The hunters are suspicious of all strangers, even other Rashemi, and assume that non-Rashemi are wizards intent on stealing souls or enslaving the innocent. They are very superstitious and carry charms and amulets (some magical, some not) to ward off hostile spirits. They fear the monoliths and avoid them at all costs. Goblins and kobolds live in the ravines and dig many warrens there, raiding mining settlements and even lowland areas when the weather is good. The largest colony of goblins is ruled by King Nanraak the Fierce (LE male goblin Ftr7), a lean and belligerent chieftain with over one hundred fighting goblins under his command. Tekun the Warlord (NE half-white dragon kobold Rgr6 of Auril) is the greatest kobold leader in the mountains and may have two hundred or more kobold warriors in his forces. Snow tigers, wolves, and winter wolves are common predators in the mountains. The normal animals are a threat to humans only when other game cannot be found, but the winter wolves maliciously seek out intelligent prey, sometimes working in concert with goblin tribes: The most powerful one known by name is Hurrahesh (NE male winter wolf Bbn5), easily recognized by his unusual green eyes. The winter wolves' sometimes work with small troll tribes, but as they compete for food and territory, this is infrequent except in times of plenty. An adult white dragon, Kissethkashaan, has been spotted in several places among the mountains but withdraws whenever he notices humans. There are many half-dragons and very young white dragons among the local kobold tribes, suggesting that the dragon, called Kashaan by the Rashemi, has been creating minions for himself. He is avoiding conflict, preferring to annex most of the High Country through his offspring. Recently, human miners have reported patrols of gray dwarves at night east of Lake Mulsantir. Apparently, the duergar have tunneled through to the surface and are surveying the area. Whether their intent is hostile or mercantile is unknown, but tensions are high among the mountain folk, and the leaders of Rashemen are investigating. Telthors and the ghosts of slain Tuigan raiders lurk in the mountains. The telthors usually wish to pass messages to their families or scare off enemies, but the Tuigan ghosts can be vengeful. Travelers are warned to avoid anything appearing insubstantial, even if on good standing with the local spirits. What seems a guardian spirit of Rashemen may turn out to be a years-dead raider from the Endless Waste looking to take revenge for the failure of the Horde. This large mine is the source of most of the country's mineral wealth, particularly iron. The place is big enough to have its own settlement, and the miners prefer to live nearby rather than travel back and forth every day or tenday. The miners are a dangerous lot, more raucous, undisciplined, and savage than most other Rashemi, but such qualities are necessary in the middle of.hostile territory. In addition to the obvious environmental dangers, the miners endure raids by kobolds and goblins, attacks from winter wolves, and in recent times, incursions of duergar from the south. The miners are very tough, and fighting one another is a favorite pastime. Boxing and wrestling matches are a common sport, with bouts held in the upper, depleted tunnels of the mines. The miners scorn anyone they perceive as weak, and the easiest way for a visitor to gain their esteem is to put up a good fight against the local champion. They consume an immense amount of firewine (see People of Rashemen) and boast that they drink more of it than any others in Rashemen. North of the Gorge of Gauros lies the Mulsanyaar Plateau, a rugged land similar in appearance and topography to the tharch of Gauros in Thay (see Thay). The Mulsanyaar is actually the northernmost arm of the Plateau of Thay, but the great gorge divides the Rashemi portion from the rest of the Thayan plateau like a moat twenty miles wide. Few Rashemi live in this southerly reach of the High Country, leaving the Mulsanyaar to the goblins that infest the region. The Iron Lord details several warbands of berserkers to keep the goblins in check and to watch for signs of Thayan movement in the Gorge - even though the canyon is virtually impassable, the zulkirs have tried to invade Rashemen by this difficult path. Under the lowering heights of Mount Omvulag stand the black towers of Omvudurth, a sprawling citadel of crude dark stone that marks the seat of the Omvurr, a great goblin chieftain. The Omvurr (LE male goblin Bbn4/Ftr6) claims the entire plateau as his realm, but in practice, his warriors steer clear of the rashemi berserkers. This icy body of water is also known as the Lake of Tears for the battles fought on its shores centuries ago between Narfell and Raumathar (and more recently by the Rashemi against the Red Wizards and the Tuigan Horde). Formed of runoff from the Icerim Mountains and possibly carved by a glacier, Lake Ashane is notorious for its cold even on the hottest days of summer. The water itself is deep, blue, and beautiful. Ashane has no surface outlets, but somewhere near its deepest point (almost a mile below the surface) it drains to a vast underground sea in an unexplored portion of the Underdark. The lake itself is inhabited by nixies, nymphs, native water elementals, and telthor fish, which protect the waters against those who would drain or defile them. Few other creatures are present except a few cold-tolerant species of fish, for the waters are too cold for most animals. The fey and telthors serve a powerful animal spirit, although only they and the Witches know its name and nature. With the exception of one trade-town, Kront, the western shore of the lake is unpopulated, mainly because of its horrible weather. The Rashemi shore has more settlements, including the large communities of Immilmar and Mulsantir and many villages and hamlets scattered between them. Most of the smaller communities survive by fishing the lake, although gardening and small farms make them moderately self-sufficient. Fishers take to the water in stout rowboats or feluccas. Terrible monsters crawl out of the Ashenwood to plague the human settlements along the eastern shore. Because of these frequent attacks, most nearby settlements have simple walls and even watchtowers, with a higher proportion of combat-ready men and women than usual. If a large number of monsters attack, the townsfolk take to the water and harry the invaders with arrows from boats. Fed by three rivers, Lake Mulsantir is a turbulent muddle of silty runoff, murky depths, and strange currents that can overturn craft or suddenly sweep a person away. Its waters flow north into Lake Ashane through a broad passage called the River Mulsantir. Rashemen patrols the lake with magically animated witchboats, piloted by hathrans. (See Magic items.) The Mulsantir is less cold than the Ashane and contains more varieties of fish, so many fisherfolk work here despite the dangers. Thay used to battle Rashemen for control of the lake, but Thay has less lumber than Rashemen, and the witchboats are far more maneuverable than any vessels of the Red Wizards. Thay eventually stopped aggressive action on the lake, preferring to invade across the River Mulsantir to the north. The Red Wizards dumped magically crossbred monsters into the lake in hopes of upsetting the witchboats, but the currents and cold made the monsters hug the southern shores and prey on. Thayan vessels and settlements, so they abandoned that practice. Boats disappear more often here than even the difficult waters would explain, so it is likely that some of these creatures remain and occasionally surface to grab a snack before retreating to the comforting darkness. This body of water lies in the center of the most populous portion of Rashemen amid the nation's major waterway. Its water is cold and filled with hardy trout, crayfish, and other tasty creatures, which provide sustenance and trade for a large number of Rashemi. The tradesfolk who harvest the lake's bounty use typical Rashemi boats and ships, and they always give the witchboats a wide berth, particularly empty ones moving under magical guidance, performing unknown tasks for the hathrans. Lake Tirulag is not as deadly cold as the Ashane, and brave or foolhardy Rashemi use the lake to prove their toughness and endurance in bizarre competitions. They strip down to nothing and swim about, with victory going to whoever remains in the water the longest. Occasionally contestants die, but normally the worst result is blue-tinged skin for a while. These competitions are followed by feasts and drinking in well-heated lodges throughout the night. Great treasure is said to lie at the bottom of the lake, although its source has many explanations. Some say it is wealth seized from those foolish enough to attack the Witches; others claim it is the secret hoard of a mad Nar wizard; and yet others believe it is a gift from the spirits of the land for anyone brave enough to claim it. The treasure remains unclaimed because its exact location is unknown, and a creature known as the ice dragon guards it. No one knows its exact nature, but it is probably a mutant aquatic, white dragon with ice-clear scales that make it almost impossible to see without magic. Strange patches of ice appear on the surface of the lake at all times of the year, usually with a hapless foreigner frozen to death inside, a victim of the dragon's icy breath. The creature is under the control of the hathrans, or at least acknowledges their power, and leaves normal Rashemi alone. Spoken of as if it were a different land, the North Country accounts for almost two-thirds of Rashemen's territory. The site of many battles between old Narfell and Raumathar, the place is scattered with old ruins and decrepit fortresses of those dead empires. Rashemi nobles explore these dangerous sites to prove their bravery and bring back great treasures. Few survive, but the reward of ancient treasure is worth the great risk. Few people live in the North Country. Those who do inhabit small, isolated farming settlements as far as possible from the nearest ruin. The local people have many stories about the ruins and those who explored them, but only a handful of these describe nobles returning laden with gold, weapons, and magic. Rumors about the nearby sites are almost always tales handed down from earlier generations, for no sensible person would approach such places. Raumathari ruins are usually clusters of tall towers, most of which are fallen or severely damaged. Guarded by lethal and large-scale battle-spells, some leach magic into the nearby area, creating odd effects and mutating natural creatures. Their treasures are usually spells designed to slaughter large numbers of foes or items that augment sorcerers' magic. One ruin, called the Towers of Smoke by the nearby villagers, constantly leaks a plume of deadly vapors (equivalent to a cloudkill spell) and is said to be guarded by iron golems of many sizes. The most famous ruin is the Ring of Gray Flames, a circle of five narrow towers, each with a harsh gray fire burning atop it. The flame emits only a feeble light but disrupts divine magic brought near it. Occasionally, grinding noises can b heard within the two intact towers. The countryside surrounding the towers is roamed by spell wards, free-willed magical constructs that seem to be spells given life. Nar ruins are squat fortresses with many underground levels used for summoning terrible beings. Protected by powerful glyphs, chained demons, and imprisoned spirits, some still contain portals into the Abyss and the Nine Hells, although the keys have been lost. Nar structures usually hold devices to summon and banish demons, as well as repositories for scroll of lost clerical spells. The Fortress of the Half-Demon is so named for the remnants of a gigantic iron gate made in the shape of a huge demonic face. It may still be the home of fiendish and half-fiendish creatures that cannot leave their place of summoning. The Fortress of the Half-Demon is currently the stronghold of Losk (CE male hagspawn Ftr4/Wiz9), a warrior-mage who leads a vicious group of brigands. These granite peaks form a spur of the mountains that define the High Country. The lower reaches have a few quarries and mines for copper and iron, but the rest of the mountains are avoided by normal Rashemi. The upper mountains have a mystical reputation and are thought to harbor violent spirits that dump rocks on visitors rather than accept offerings. As well, trolls and bheur hags plague the region. Unknown to most except the Witches, these mountains are the secret lairs of the vremyonni, or Old Ones, male Rashemi wizards who manufacture magic items for the Witches and train the young recruits in arcane magic. The caves of the Old Ones are well guarded by rare spells and sealed with great stone doors that require the proper magical command word to open. Along the northern edge of the Running Rocks is a deep fissure in the earth known as Immil Vale. No matter the season or temperature above, this place is continually warm and green. Grass, flowers, and trees grow everywhere, and crystal-clear streams are free of ice year-round. Many kinds of colorful birds nest here that live nowhere else in Rashemen, while deer and small animals live in the underbrush, hunted by small predators such as lynxes. Legend has it that the goddess of magic blessed this place with protection from the cold so the Rashemi would always have a vision of spring even in the heart of winter. The real explanation is mundane-subterranean volcanic activity heats underground water, keeping the vale warm and creating many hot springs, which emit clouds of steam. Fortunately, these springs are not tainted with the brimstone stench of some volcanic vents, so the air is pleasant. Sometimes the vale fills with mist, giving it an ethereal quality and enhancing its magical reputation. Many spirits live here, bound to the trees and stones. One famous spot is the Mosstone, a huge moss-covered piece of rock near the center of the vale. Those who camp in the stone's shadow are blessed with prophetic dreams and are sometimes visited by Hulmarra Murnyetha (N female telthor human Rgr9), a beautiful and skilled Rashemi tracker killed by a Red Wizard over two hundred years ago. She was fond of visiting the rock, and after she died, her spirit found its way back to it. Hulmarra sometimes steels away visiting men who remind her of her long-dead husband, returning them years later looking not a day older. Another notable feature is the Red Tree, a large aspen with about half its leaves turning colors as if it were autumn. The spirits of two Witches - Imsha (LN female telthor human Sor4/Clr3/Hth1 of Chauntea) and Tamlith (LN female telthor human Sor3/Clr4/Hth1 of Mystra) are tied to the tree and give advice to other Witches who visit them. The spirits dislike idle chatter and only speak of important things, particularly involving the safety of Rashemen. In addition to the spirits described above, many telthors and thomils inhabit the vale and vigorously defend it from aggressors. The Witches are on good terms with the spirits and elementals, and can sometimes convince telthors to undertake short missions outside of the vale but within the spirit creatures' safe distance. This forest north of the Sunrise Mountains is dense and wild. It could be considered the mystical heart of Rashemen, for the Witches hold their most secret meetings in this place and allow no person to enter who is not part of their sisterhood. The penalty for violating this prohibition is death, and the Witches are not lenient to anyone, even first offenders, the lost, or the ignorant. Because of this extreme law, warriors and scouts of the Iron Lord patrol the perimeter of the forest to warn away those who might brave its dangers. The Witches are not cruel; after questioning (not torturing) violators, they put them to death in a quick and humane manner (often using sleep spells or drugs first). They confiscate any property and then take the bodies to the edge of the forest for disposal by the perimeter guardians. Normally, the Witches do not have to slay intruders themselves. All the native telthors are absolutely loyal to the hathrans and either attack those who cannot prove themselves to be Witches or inform larger telthors or the hathrans about them. In the cold season, the telthors are aided by orglashes. Large sections of the forest are warded by alarm spells enhanced by circle magic, and particularly secret areas are guarded with dangerous glyphs, similarly enhanced. In addition to their private councils, the Witches come here to commune with the guardians of the land, make offerings, bind and control excessively hostile spirits, and brew the famous Rashemi firewine. In meetings, they discuss happenings within Rashemen, receive reports from hathrans returning from abroad, use scrying magic on the Red Wizards, and plan for the needs of the people in the upcoming season. Young ethrans who have come of age are ordained within the Urlingwood before taking their first journey outside of Rashemen, and young men who are to join the Old Ones are brought here to receive the blessing of the spirits before going into isolation in the Running Rocks. When not in council or traveling, most of the Witches live in the nearby town of Urling.